Holy moly, Apple fans… that was a wild ride. The huge WWDC 2016 keynote was packed full of announcements spanning nearly every single one of Apple’s product lines. Software was clearly the star of the show — this is, after all, a developer conference first and foremost — and we all know where everyone’s focus was on Monday: iOS 10. Apple’s new iOS 10 software for the iPhone, iPad and iPod touch is a huge step forward for iOS devices and for mobile platforms in general. It’s still the smoothest, it’s still the fastest, and now it has even more great features packed in. What were the best and most exciting new iOS 10 features Apple unveiled on stage in California on Monday? You’ll find them all listed right here. In iOS 10, Apple has completely redesigned the lock screen. iOS 10 has a new raise-to-wake feature that wakes up to display the lock screen without having to touch any buttons. This is a great solution since TouchID often bypasses the lock screen so people miss important notifications. The updated lock screen also includes new features that give native apps and third-party apps an interactive interface (exchange messages, etc) without ever leaving the lock screen. You can also finally clear all of your notifications at once with a 3D Touch gesture, and widgets are available on the lock screen with a quick swipe to the right. Siri is being opened up to developers, which is pretty darn awesome. Siri intelligence is coming to the keyboard (yikes!). In all seriousness though, Apple is using deep learning to dramatically improve Quick Type suggestions. There will also be killer Siri integration that uses contextual info. For example if someone messages you with “Where are you?” Quick Type will offer your current location as a suggestion. Advanced deep learning techniques now bring facial recognition to the Photos app. It’ll group all of your friends and family into albums automatically, and it’ll do the same with scenes and objects (mountains, horses, trees, etc). Amazingly, this is all done locally on your device so Apple doesn’t need to send all of your private data to its own servers for analysis like Google does with similar features in the Google Photos app. It’s similar to HTC’s Zoe feature, but a bit more in-depth in some ways (in others it’s just a straight-up Zoe ripoff). In iOS 10, Apple is adding new proactive features to Maps along with a complete redesign. So for example, your iPhone knows you typically go to work around the same time so if you open Maps around then, it’ll offer to guide you around traffic to work. That’s right, Maps now offers traffic on route! Proactive location features will also give you quick access to nearby restaurants when you open the app around dinnertime, for example. Apple also announced Maps Extensions, which are available to third-party developers. For example, if you search for a restaurant you can use an OpenTable extension to make a reservation. Then you can use an Uber extension to book a ride — all without ever leaving Maps. Apple Music is a great new service that Apple unveiled last year, but there were tons of customer complaints as well. 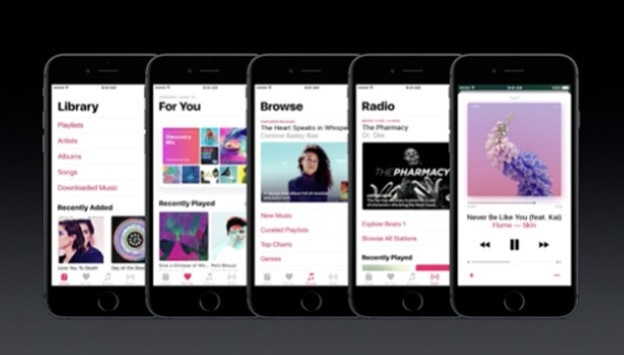 As a result, Apple Music has been completely redesigned. The new user interface gets out of the way better than the old one, and it’s much cleaner than the old, confusing app. The first tab is now your music library, which seems like a no-brainer. On the Now Playing screen, you’ll also now find lyrics! There’s now a cool new discovery mix at the top of the For You tab that’s made automatically with new recommendations based on what you listen to and like. A recently played playlist is also easily accessible. Connect has been moved off of the main tabs and is now integrated into artist and band pages. 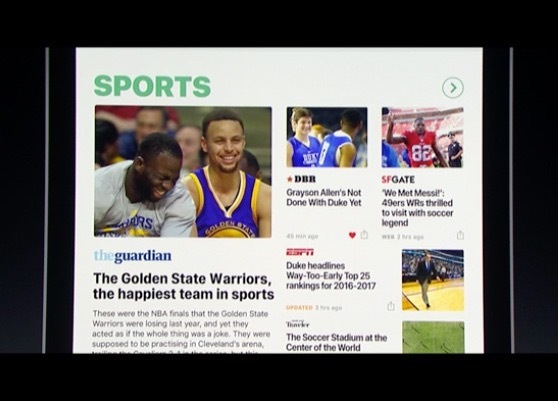 The third tab is the Radio tab, where Beats1 is still highlighted most prominently and other radio features are available as well. You’ll also now find a dedicated search tab. The Apple News app has over 650 million monthly readers, and now it has been completely redesigned. The new UI is gorgeous and it looks just like the Apple Music app. app offers quick access to your favorite topics and it even creates new topics based on things it thinks you’ll like. Subscriptions are also being made available, and breaking news notifications are being added as well. 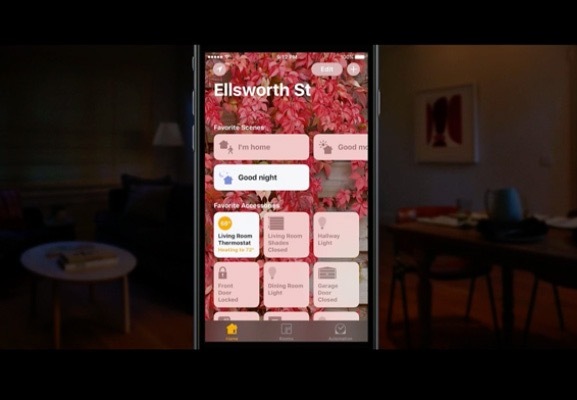 With iOS 10, Apple is introducing a new app called Home. All of your HomeKit compatible accessories can be controlled in the Home app. It supports all the features most smart home hubs support, including scenes. For example, a “good night” command can draw all your blinds and turn off all your lights. HomeKit device controls are also being added to Control Center, and you can use Siri commands to control anything that can be controlled in Hime. An update to the Phone app! Apple’s Phone app now automatically transcribes your voicemails, which is a huge deal. There’s also an extension API that will let supported spam lists block spam calls without any intervention needed from the user. A new VoIP API lets VoIP apps integrate into the Phone app, the lock screen and more, just like regular voice calls. 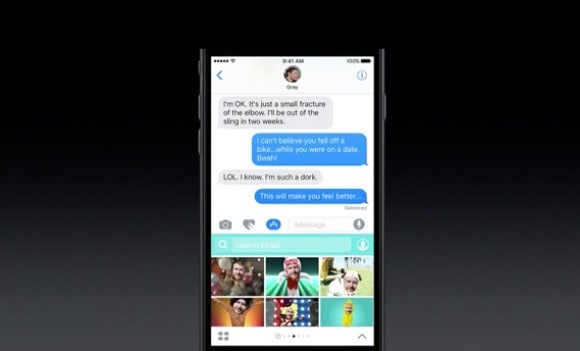 Messages is the most frequently used app in iOS, and Apple added tons of new features. Rich links give you previews of content when you receive a message with a link — videos on rich links will play right in line automatically, and music can be played right from within the app when someone sends you a link to a song in Apple Music. Emoji are three times bigger on the keyboard, and Quick Type offers emoji suggestions. Handwriting and Digital Touch (like on the Apple Watch) are also now supported. Lastly, new bubble effects let users send messages with animated chat bubbles. They can grow larger for shouting, smaller for whispers, and there are some other effects as well. The animations are very cool — for example, a slam bubble effect slaps a new message in there and shakes all of the other messages that are already in the chat. Oh, and iOS 10 now also supports iMessage apps, which will let developers built apps that are available to users through an iMessage app drawer. Notes collaboration: Work live with multiple people in a note. Live Photo updates: New digital image stabilization and editing features have been added to Live Photos on the iPhone 6s and iPhone 6s Plus. Split view in Safari: View two websites side by side in Safari. Sadly, this only works on the iPad.